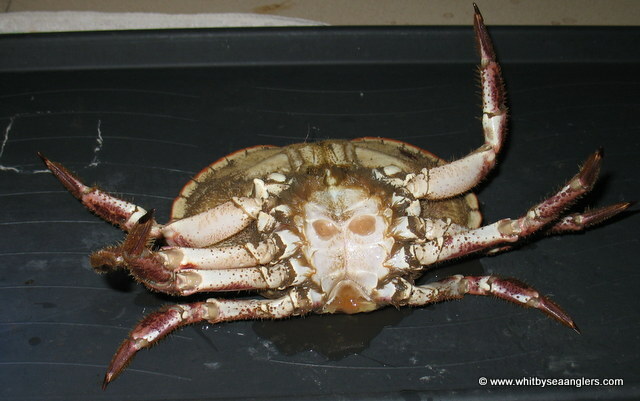 Edible / brown crab, Cancer Pagurus, Carapace or cart, is the raw meat taken from the hen crab during the winter months. If you are going to make your own cart baits you will need to buy your crabs from a 'shell fisherman' / fish market, who will sell you crabs of a legal size. It may look easy but you never know whether or not the crabs you have purchased are full of coral. Never buy dead crabs as the meat inside will probably be black and definitely off. Alternatively you can readily purchase cart, on-line, or from local tackle shops. The highest quality 'cart' is 100% coral - expensive but worth it. Everyone will have their own method of extracting the cart meat and the preparation thereafter but this is how I prepare my cart baits. 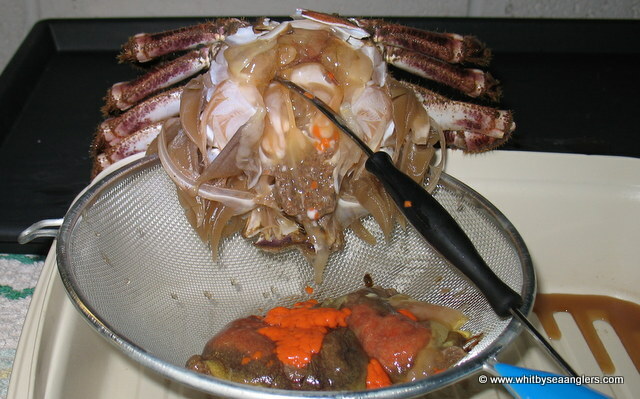 I used to cut the crabs in half, allow to drain, before scrapping out the coral and cart meat. 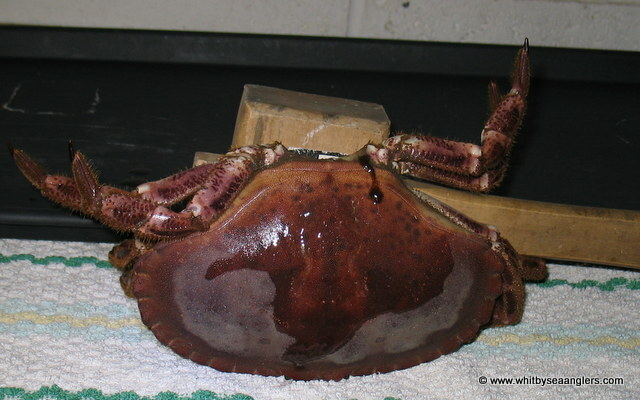 Remove both claws (above), (unless you have purchased a box of clawless crabs), remove the thorax which is the large flap covering the abdomen (as seen below). 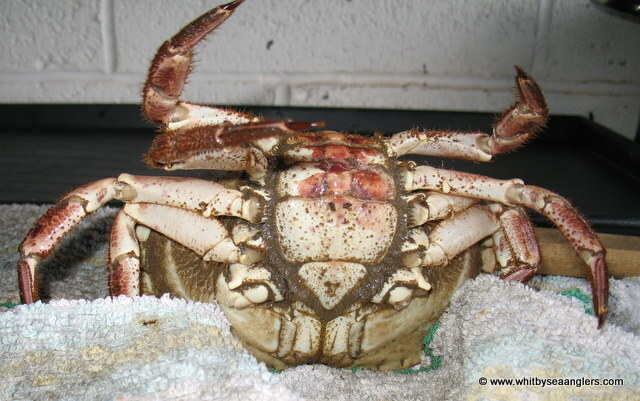 Place the crab face down (on a towel is recommended as this will keep it steady and catch any water) and dispatch the crab by striking, with a wooden mallet, at the point where the thorax meets the upper shell. 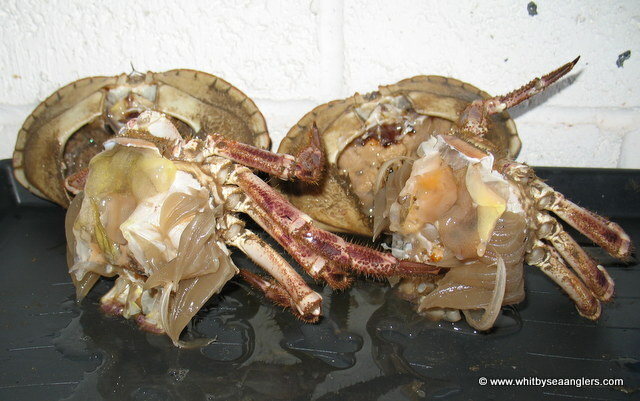 By holding the remaining crab legs, and the shell, the legs can be parted from the upper shell (as seen below). 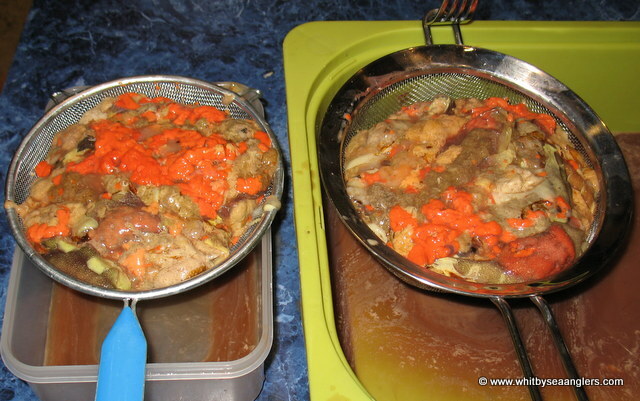 Place the halves of the crab vertically on a suitable tray, so as to drain any water off. These 2 crabs, above, were completely void of any orange coral. 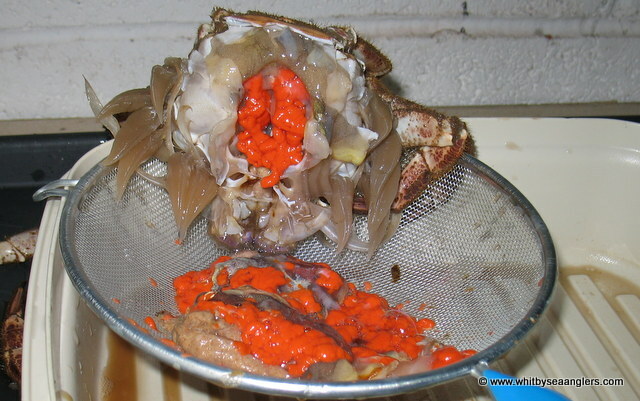 Repeat the process until you are rewarded with a coral (bright orange) laden crab, as below. 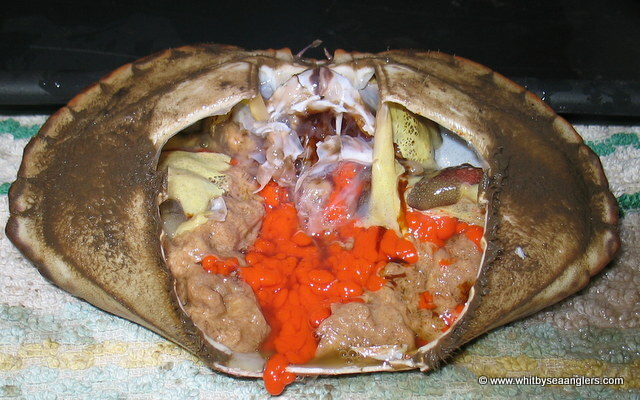 Note the quantity of liquid in the shell, this liquid must be drained off, hence why the crab shells are place vertically on a tray (as above). 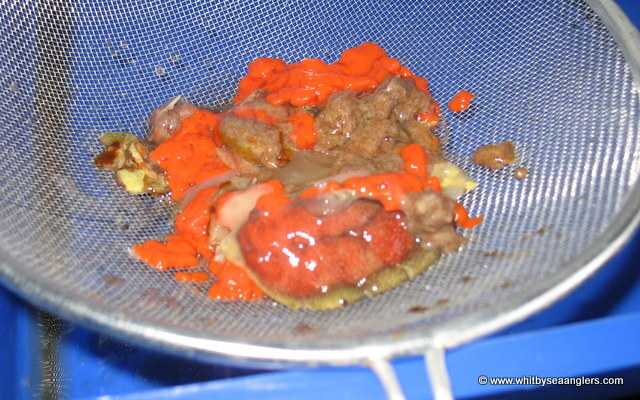 Pick out the flesh and coral (orange) into a sieve, as below. When suitably drained empty into a tray. 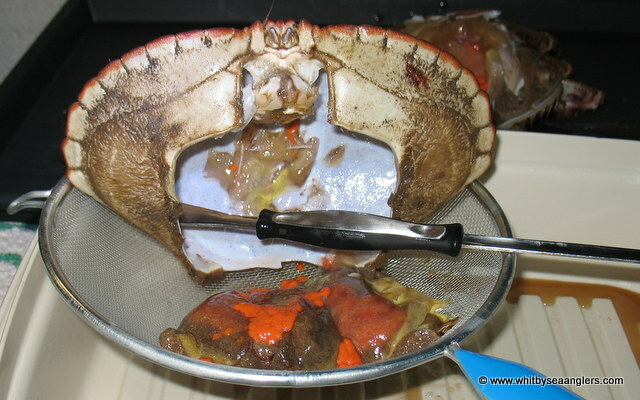 The ideal tool for picking the carapace out of the shell is a crab / lobster pick, as below. Repeat with the main body making sure none of the crabs gills (deadmen) fall into the sieve. Plenty of coral in this one (above). Once the shell and body have been picked clean, both can be discarded (below). It is the luck of the draw to split open a coral laden crab, many will be empty, but I still use the meat. Make sure it is well drained, once frozen it will cut very easily with less water / ice. 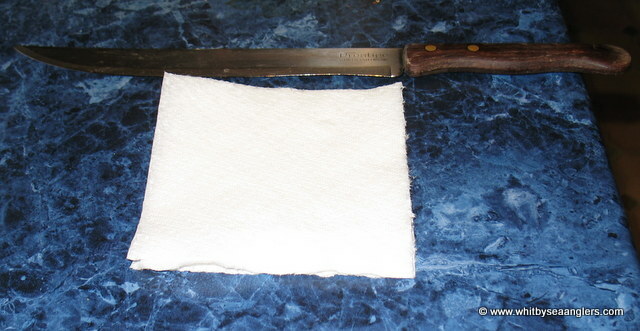 Continue to drain any excess liquid, roll up a piece of kitchen towel and place around the edges of the tray (as below under the scissors). Mix up the cart meat with the coral, squeezing between fingers and thumb and cut up any large pieces of the wings / shoulders of the crab as this will make filling any moulds easier. 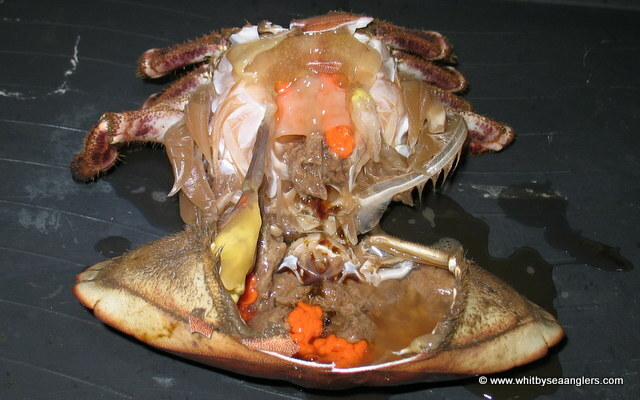 Remove any pieces of shell and the mandible / mouth parts. 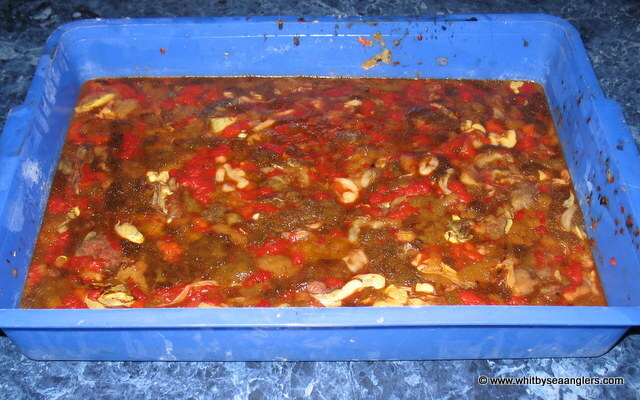 A cat litter tray filled to a desired thickness to make a block of cart. 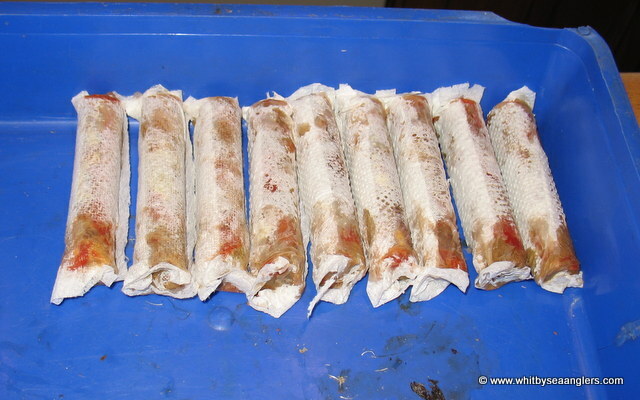 Alternatively, 'Ice Stick Moulds' make the best cart baits, see later below. 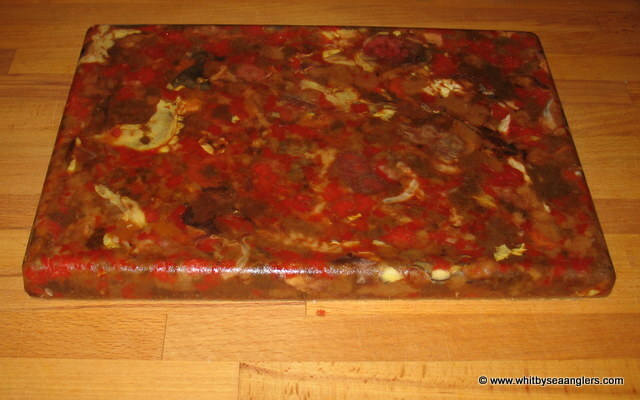 Once frozen lay block on chopping board and mark up to the desired size of baits. 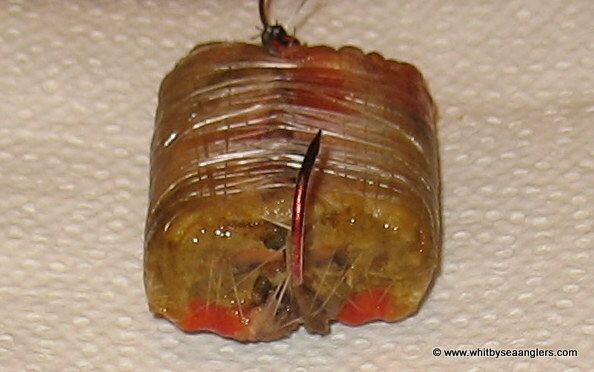 Cut length ways to the desired width of your cart baits. Providing you have not left too much water in the cart it will cut very easily. Too much water and it will shatter and not cut evenly. The next stage is to wrap the individual cart sticks, some use 'tea bag' material, others just food wrap*, I use kitchen tissue. Cart is essentially a scent trail, and if not wrapped in either food wrap, tea bag or fine paper, it will dis-integrate too quickly, the paper / food wrap slows this down. 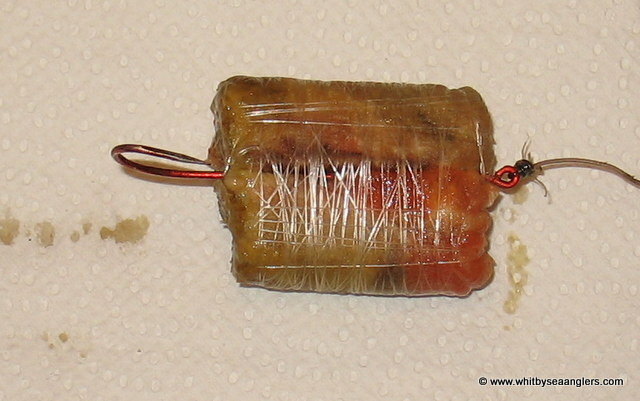 *Then before wrapping on the hook the food wrap is punctured. 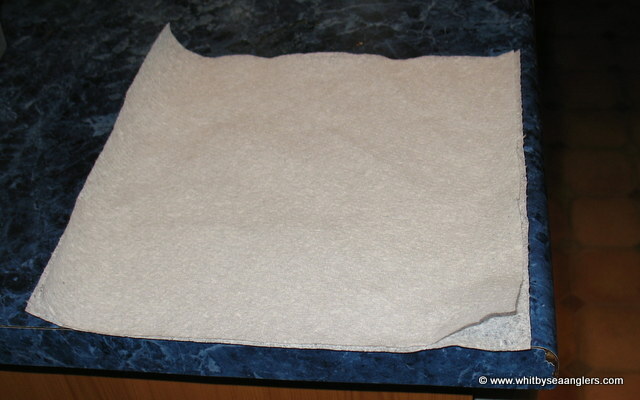 One sheet of '2 ply' split, and laid back together, before folding and cutting in half. Folded in half, and cut again, will give you 8 pieces. Time is of the essence as the cart is starting to melt, while some moisture is required to bond the tissue to the cart meat you want it to retain its shape. 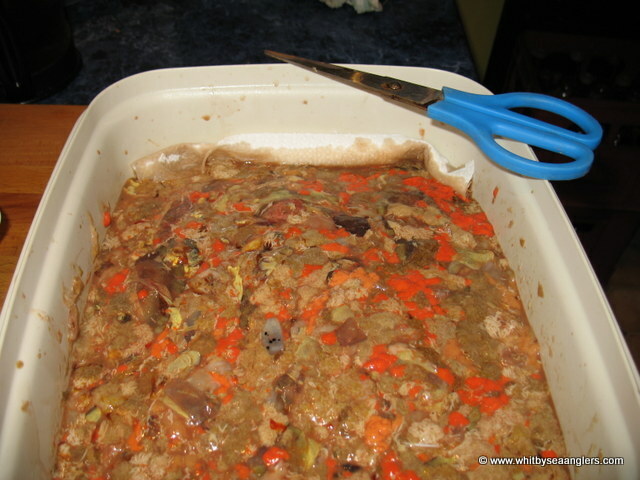 Once wrapped, place in a tray, making sure they do not touch each other, use a piece of tissue or food wrap to separate layers. 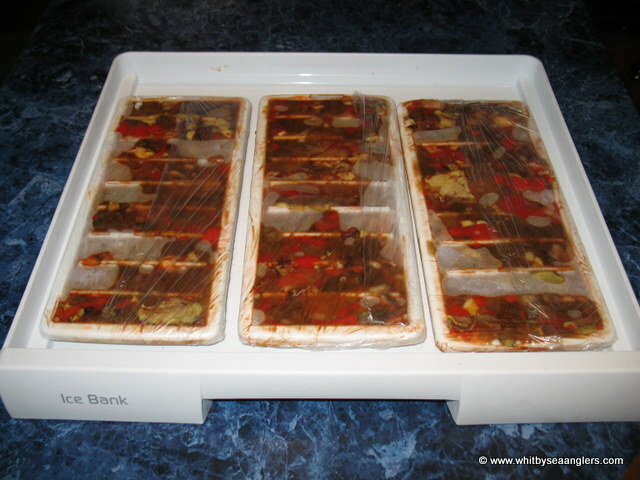 Once all are wrapped up, place back in the freezer, in an hour or so they can be individually wrapped in plastic food wrap, which will stop freezer burn. 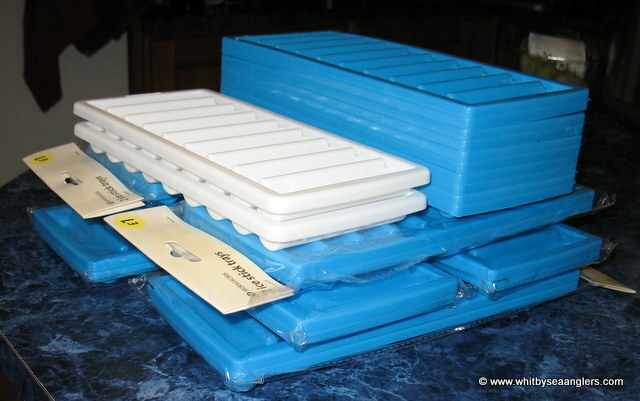 Ice stick trays filled with cart, wrapped in food wrap to stop spillage and frozen. 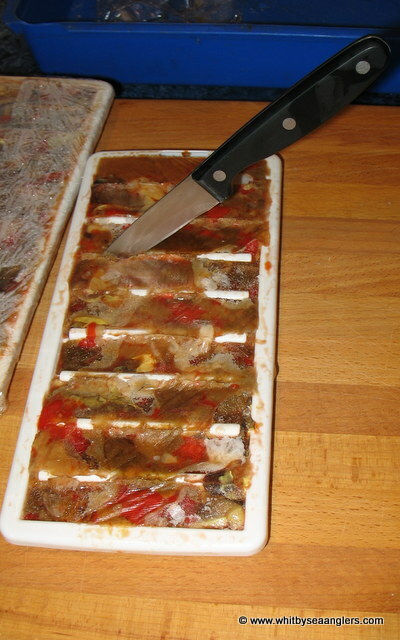 The frozen ice stick tray has had the food wrap removed, now twist the corners of the tray back and forth first, as you would a tray of ice. Using a paring knife, cut through any cart which joins two sticks together. Run the knife down the edges and tease the blocks out. 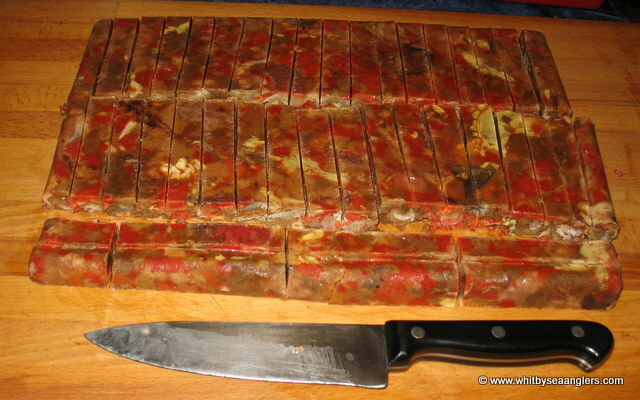 Laid out on the chopping board, the excess can quickly be trimmed off, before wrapping in tissue. As with the large block of chopped up cart it is quickly wrapped in tissue. 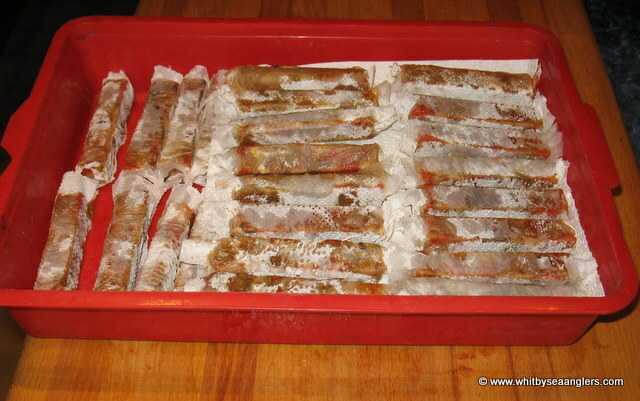 Wrap up the wet cart stick, place in a tray and pop back in the freezer as above. 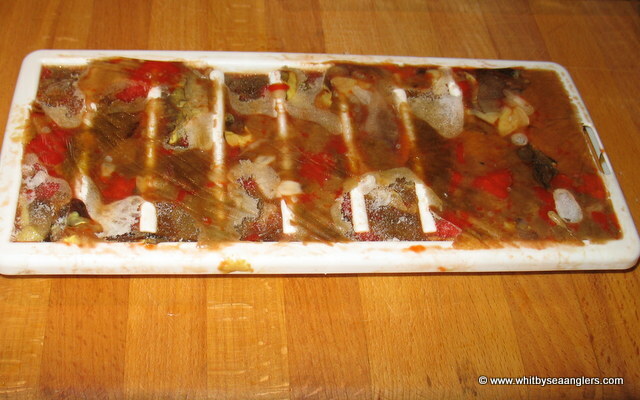 Use any dry parts of the wrapped cart stick to mop up any juices on the chopping board. 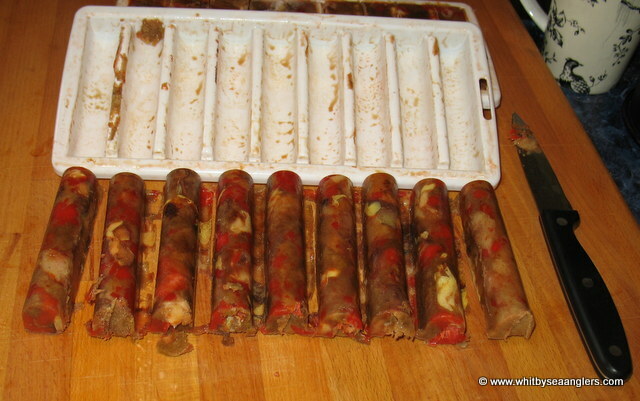 Wrapped cart sticks removed from the freezer can now be wrapped in cling film / food wrap. 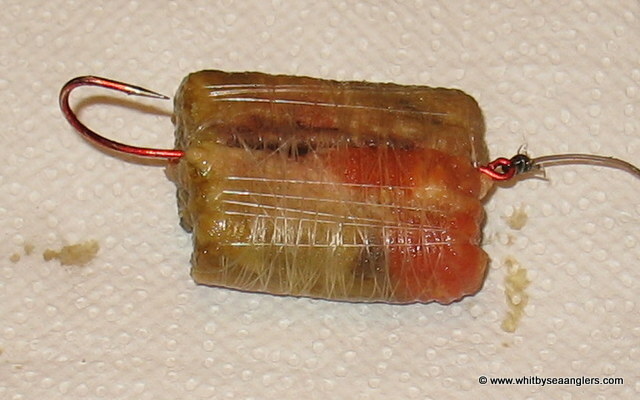 This stops freezer burn and stops the cart sticks from sticking together in both the freezer and your cart / bait flask. 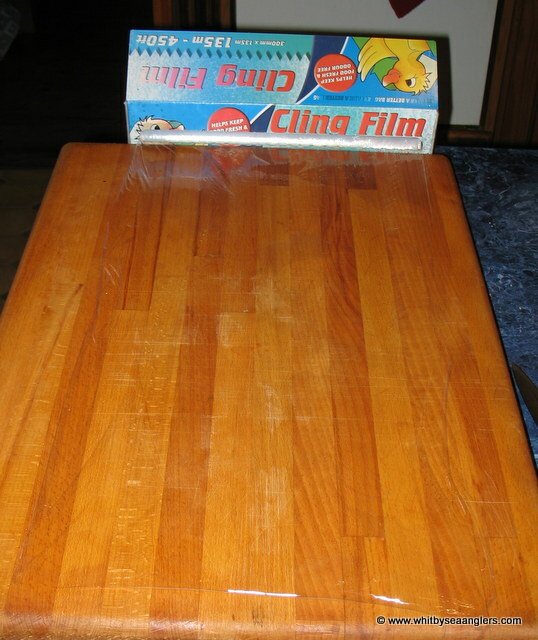 Place cling film / food wrap box behind chopping board, wet the chopping board with a damp cloth, before pulling out the film. 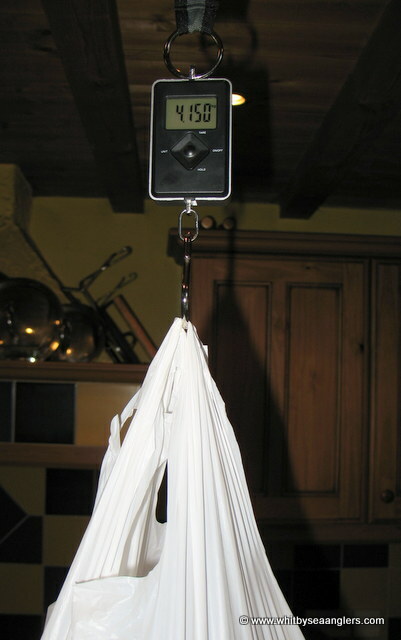 This stops the film curling up due to static electricity. It also gives tension to the film when the cart sticks are individually rolled up. 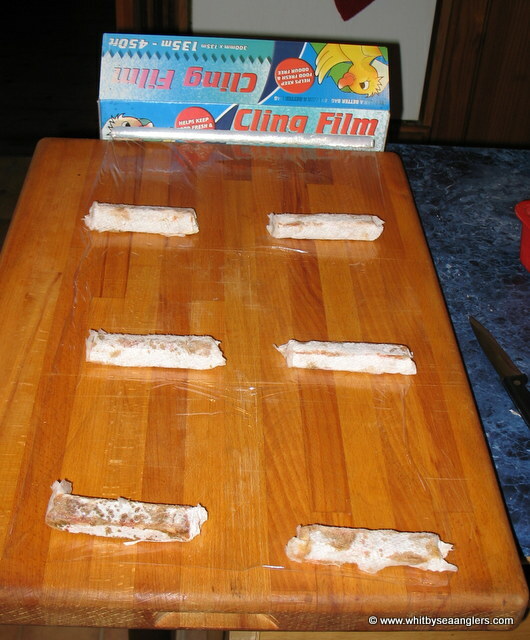 Place some cart sticks on the film, cut down the middle and across, allowing 7" length for adequate wrapping. 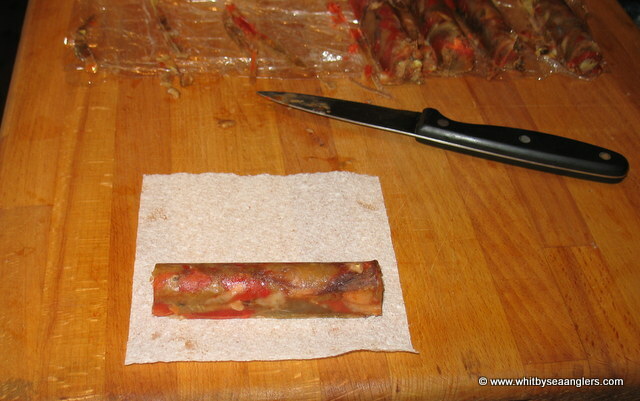 Once wrapped, twist the ends, so sealing the cart stick. Job done, place back in freezer. 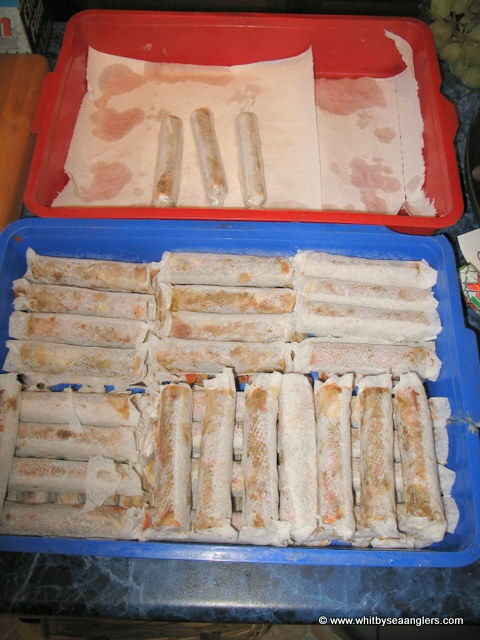 Make your own judgement call as to how many sticks you remove from the freezer to wrap and how many you wrap before placing them back in the freezer. One hundred and fifty two cart sticks from one box of crab, it is a lot of messy work and some only use the coral. 4.15 Kg of cart sticks was the total from that box of brown crab. 152 sticks, potentially 300+ baits. The all important question "Where can I purchase the Ice Stick Trays?" The white trays, make 9 cart sticks and are from Poundland. The blue trays, make 10 cart sticks are from Morrisons. Both are £1 for 2 trays. For a full box of brown crab you will need 8 packs. 8 x 2 x 10 = 160 sticks, well worth £8. 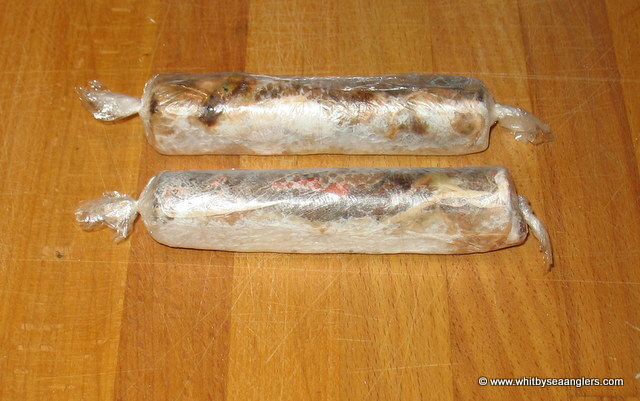 Any left over bait from a nights fishing can be used to fill a few sticks and therefore not wasted. Ideal for both worm and mussel. Cart sticks are an ideal size when loaded into a bait flask along with some peelers, on the right. Ideal bait flasks, below, LH is the Coleman, ideal for an Open Match and RH is a small bait flask (Boyes), ideal for a 3 hr / 4 hr club match. Top tip - Keep your bait flask in the freezer - keeps bait frozen for longer. 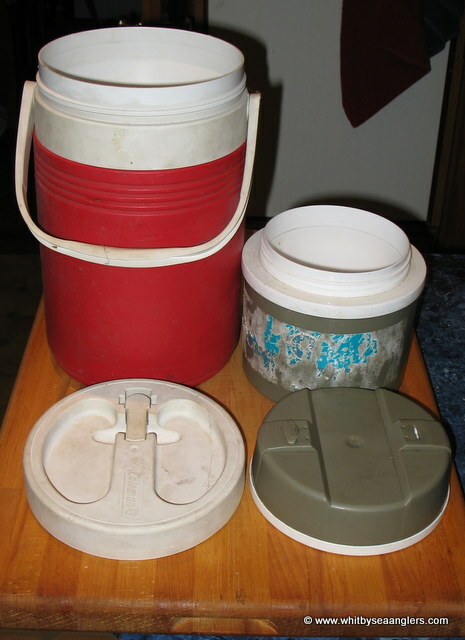 Due to the low water content in cart it can thaw quicker than a peeler, keep lid on your flask. 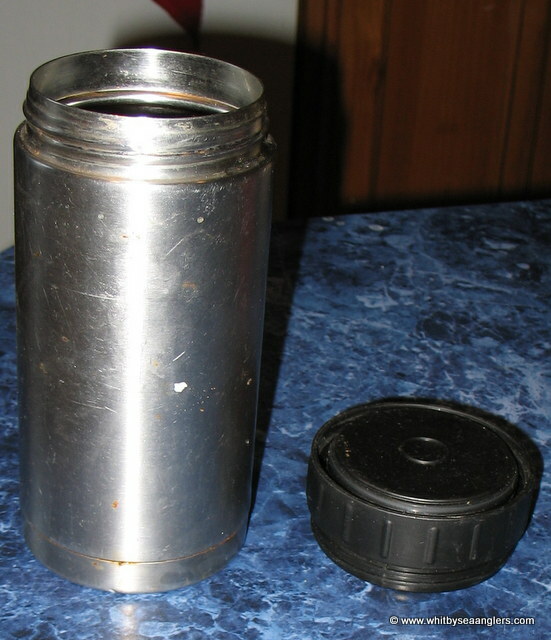 Mini un-breakable flask, use gloves when retrieving from freezer, as fingers will stick to the steel. 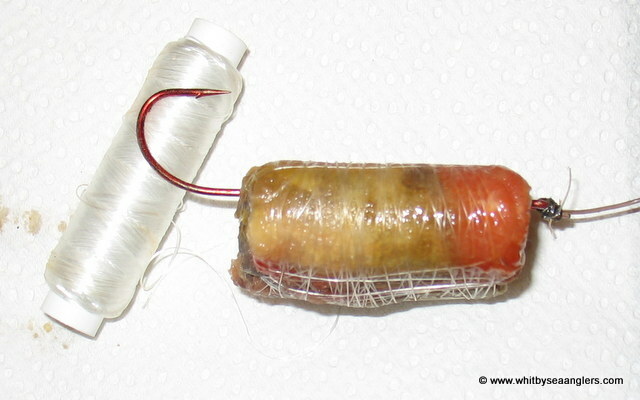 Once fishing, I unwrap a frozen cart stick from the food wrap / cling film only, cut in half, place both halves together, around a long shank 7/0 hook and wrap on with plenty of cotton (as below). As you are wrapping the cotton, the cart can be moulded into the desired shape, as it is very pliable. 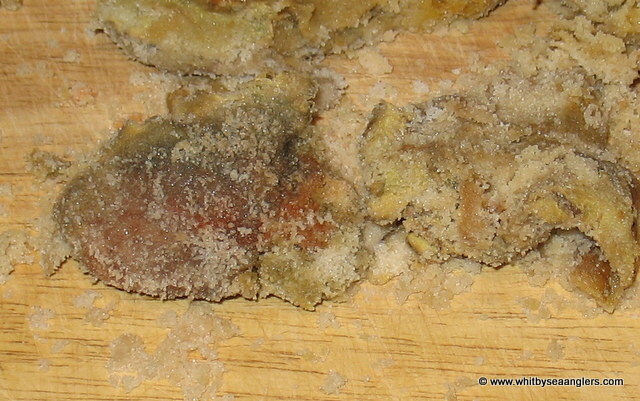 Any other bait of your choice can be added, be it a peeler crab, razor, mussel or worm. It's all about building up the layers. 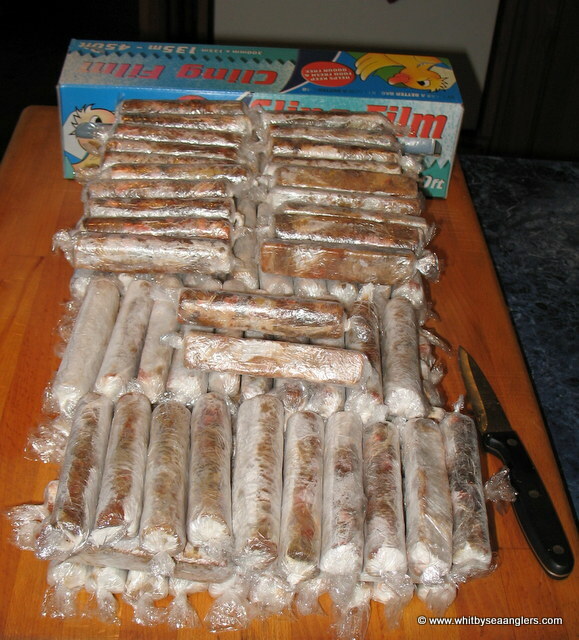 Some anglers make cart sausages, made as the cart starts to freeze, once frozen the food film is just punctured, wrapped onto a hook and additional cart wings added, making a cart only bait. Hope this is useful, it is by no means the definitive method but can be adapted to suit. 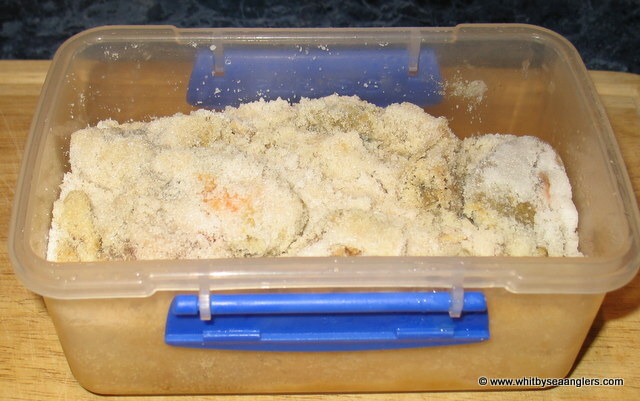 Take a plastic container and cover the bottom in a centimeter of table salt, then place enough of your well drained cart wings/shoulders to cover the salt. Poor more salt, enough to cover the cart and add more cart wings/shoulders on top of the salt and, again cover in salt. 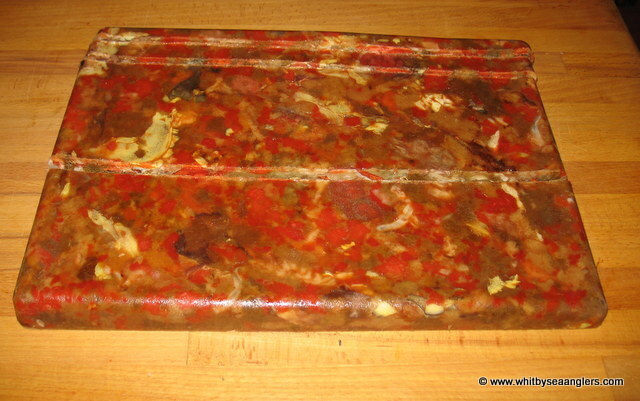 Cover with a lid/food wrap and place in fridge. After 12 hrs pour away any liquid, turn the cart wings/shoulders and add more salt, repeating this daily until no more liquid is released. 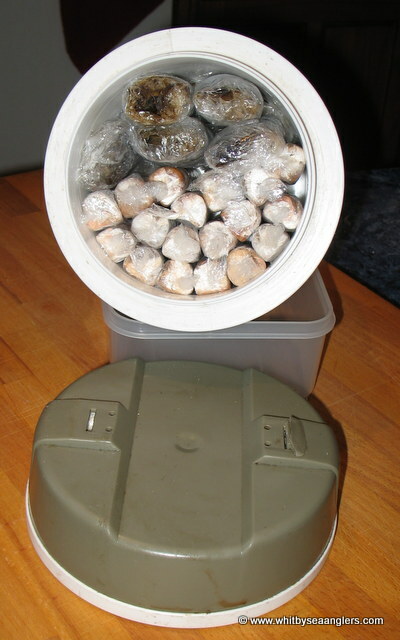 Salted cart which I did on 14th December 2013 & has been in the fridge since then. Salted cart has the texture of play-doh. 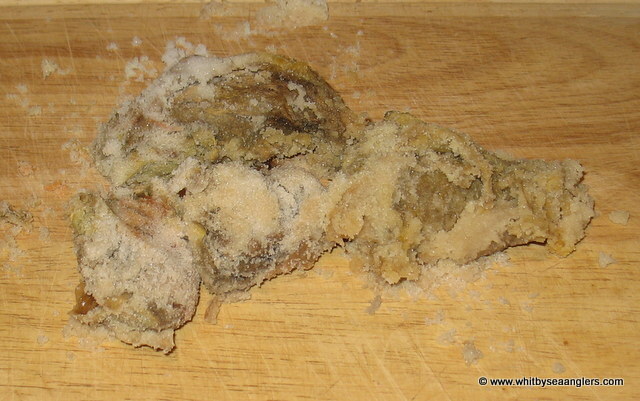 This salted cart has been sat in the fridge since 14th December 2013, has been drained regularly and more salt added. It has the texture of play-doh and can be moulded into shape and whipped onto a hook with plenty of cotton. As long as there is plenty of salt none of this has 'gone off', but it is only 1 month old. Keep you posted as to how long it stays this way before rotting. 15/10/2014 - still no signs of rotting. Shortly after posting the 'salt method', WSAA member Matthew Garbutt shared a top tip - after 5 days in salt, brush off all the excess salt, wrap in food wrap and freeze.